The plane's whereabouts are still unknown despite a massive international search in the southern Indian Ocean. Malaysian officials said that the recovery of the missing aircraft remained a priority and that they had pursued "every credible lead". "All 239 of the passengers and crew onboard MH370 are presumed to have lost their lives," he said. Following Thursday's announcement, China's foreign ministry called for compensation for the victims' families. "We call on the Malaysian side to honour the promise made when they declared the flight to have been lost and earnestly fulfil their compensation responsibilities," spokeswoman Hua Chunying said in a statement. Despite Thursday's announcement, the Malaysian authorities are not ruling out foul play, reports the BBC's transport correspondent Richard Westcott. He says it is a legal move designed to help families claim compensation. 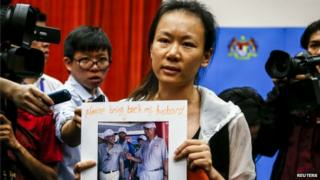 Malaysia Airlines said they would be contacting the families to proceed with the compensation process. But in China, some family members refused to accept the official position that the plane was lost. "They have found nothing," said Li Jingxin whose brother is missing. He told the Associated Press news agency that his family would not accept compensation from the airline at this time. In a pre-recorded statement on national TV, the Malaysian authorities announced that the disappearance of flight MH370 was an accident and that there were no survivors. But some families were upset that the government decided on the fate of their loved ones without any concrete evidence. Others complained on social media that the authorities should have informed the families before making the announcement. Ten months on, it is clear that the Malaysian government is struggling to rebuild trust with families of the victims. Many have refused to begin the compensation process, worrying that if they do then officials will stop searching for the plane. However, Malaysian Transport Minister Liow Tiong Lai says the governments of Malaysia, China and Australia remain firmly committed to the ongoing search. The DCA plans to release an interim report on its crash investigation on 7 March.